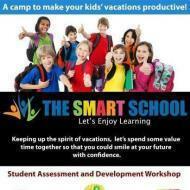 The Smart School is a sincere effort to an effective way of learning. Academic and personal skills are taken care of equally. Personal one to one sessions to get good assessment and to ensure quality monitoring. Communication skills and public speaking skills are monitored too. Different group sessions for activities and other soft skills development programs. Its not just learning, but an overall development of skills. We give a smart grooming to ladies with our Zumba and Yoga sessions. Special dance sessions combined with the work outs like yoga dance and other cinematic styles to make the sessions more fulfilled and effective. The Smart School conducts classes in Class 11 Tuition, Class 12 Tuition and Class 6 Tuition. It is located in Union Christian College, Aluva. It takes Regular Classes- at the Institute.